Certification is based on an objective, professional and critical evaluation. 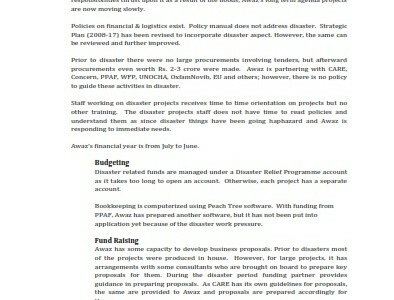 It is aimed at enhancing an organisation’s credibility as a nonprofit organisation, increasing its capacity to access philanthropic assistance, helping in diversifying its resource base and facilitating in obtaining tax benefits from the Government of Pakistan (under section 2 (36) read with section 61 and clause 58 of the 2nd schedule of the Income Tax Ordinance, 2001). The profiles of certified organisations are included in the Directory of Certified NPOs, the first of its kind in Pakistan. The profiles (also placed at PCP web site) include a brief history of the organisation, major programme activities, achievements and all such information that projects the organisation as a credible and effective partner. The certification process identifies the strengths and weaknesses of the organisation within the parameters it is being assessed, emphasises institutionalisation of systems and processes, and allows policy inputs/ recommendations for further improvement in its internal governance, financial management and programme delivery structures. 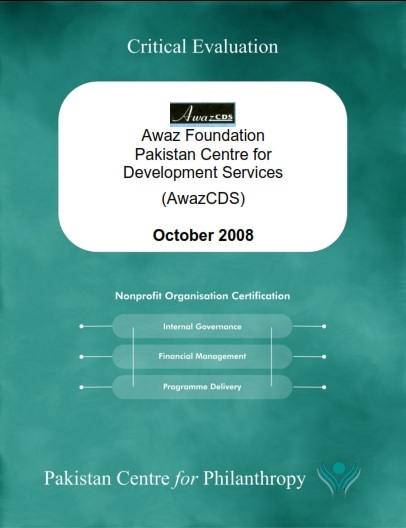 The Pakistan Centre for Philanthropy (PCP) evaluated Awaz Foundation Pakistan Centre for Development Services (AwazCDS) for certification against standardised parameters in Internal Governance, Financial Management and Programme Delivery as contained in the Certification Model. The evaluation (comprising a detailed desk review of organisational documents, a visit to the organisation’s head office, to its field offices at Ali Pur and Vehari and Vaseeb Development Committee (VDC) Almadina in Basti Ghulam Muhammad) was conducted in August 2008.